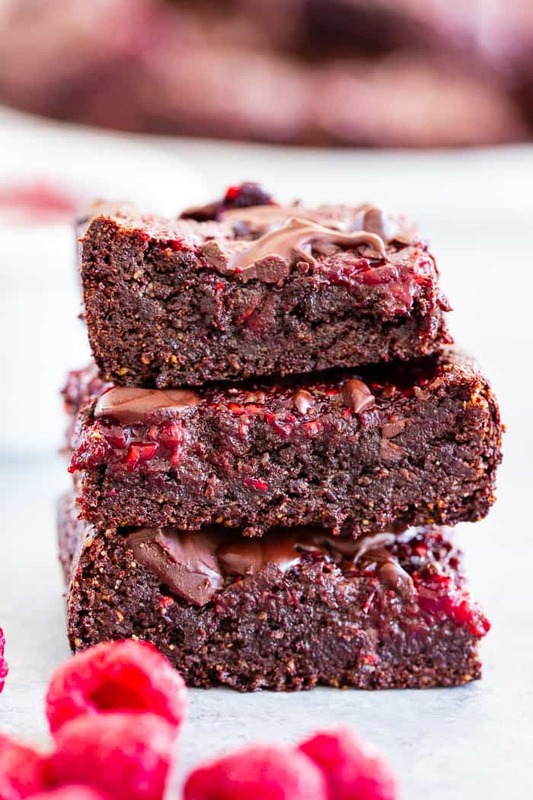 These insanely fudgy raspberry brownies are easy to whip up and just happen to be good for you! 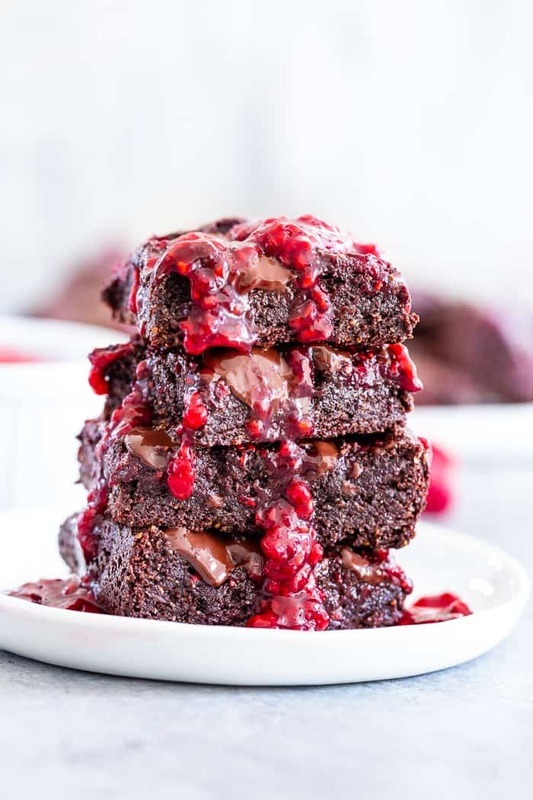 Rich chocolate paleo and vegan brownie batter is baked with an easy raspberry sauce for the ultimate fruit and chocolate combo. They’re gluten-free, dairy-free, and completely addicting! 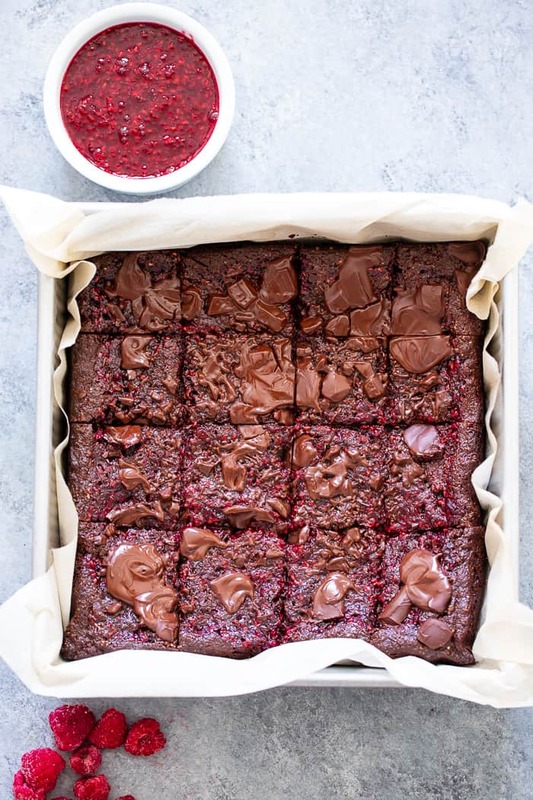 We’re starting today with my new favorite brownies – these super fudgy, sweet, rich, chocolatey, raspberry ones! 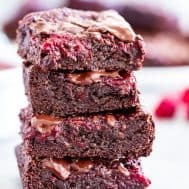 I tweaked my original paleo and vegan brownies a bit to accommodate lots of raspberry yumminess and they did not disappoint one bit! We start by making the raspberry sauce itself. This way it has a chance to cool and thicken while we prepare the brownie batter. The sauce is super easy – raspberries (frozen is fine) plus maple syrup and some tapioca to thicken it. It doesn’t cook for long and it comes out sooo yummy – just try not to eat all of it before you make the brownie batter! Although, you’re actually only using half of it for the brownies themselves – the rest you save for topping while serving. So, I guess technically speaking we can all eat up to half of the raspberry sauce and still save the brownies. Just saying. But now onto the brownies! Although they do contain a list of ingredients, they’re also quite easy to prep. The wet ingredients are mixed on the stovetop to get everything nice and melty, and then the dry ingredients are mixed in at the end. 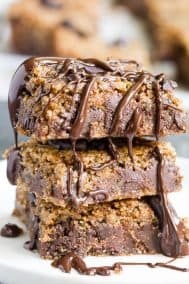 You will need 2 “flax eggs” for this one since it’s vegan, and I honestly feel they lend to the really fudgy gooey texture, so I recommend using them instead of eggs! If you really want to use eggs, 1 whole and 1 yolk should do it. Anyway, the flax eggs are easy to make – 2 Tbsp flaxseed (ground) mixed with 5 Tbsp water works for me. You’ll allow it to sit for about 10 mins while you prepare the rest of the batter. Easy peasy! Seriously, that sauce is so good! In the brownie pan, you’ll layer the brownie batter with 1/2 the raspberry sauce, and then sort of swirl it in to incorporate. This doesn’t have to look pretty, but it will in the end anyway! After baking, I sprinkled some chopped dark chocolate over the top, which melts and makes these even more chocolatey and rich. The brownies will need to cool completely in order to get that nice fudgy texture that’s easy to cut into pieces. I typically chill mine to speed up the cooling! 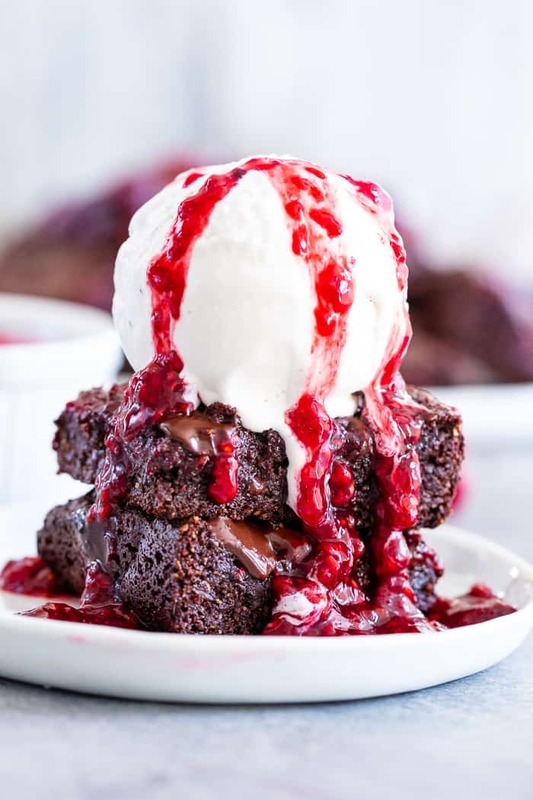 If you’re really going for that WOW factor, make a brownie sundae with a scoop of coconut vanilla ice cream and the rest of that raspberry sauce. Seriously, this combo is even better than you’re imagining! I hope you’re ready for chocolate bliss because it’s absolutely about to happen in your house – let’s go! Place raspberries and maple syrup in a medium saucepan and set heat to medium. Bring to a boil, stirring to avoid burning. Once boiling, mix together tapioca and water and stir into raspberry mixture. Continue to cook and stir 3-5 more minutes until thick and syrupy, then remove from heat to cool. Prepare the flax eggs as described above. Preheat your oven to 350 degrees and line an 8 x 8 baking pan with parchment paper. In a medium bowl, combine the almond flour, cacao powder, coconut sugar, baking soda and sea salt. Set aside. 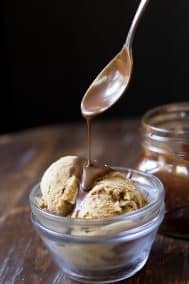 In a medium saucepan, melt the chocolate over very low heat, stirring constantly. Add the almond butter and stir to combine, then remove from heat. Stir in the coconut oil, maple syrup, flax eggs, and vanilla extract until smooth. Add the dry ingredients to the wet mixture and stir well until a thick brownie batter forms. Transfer batter to the prepared baking pan and spread evenly (it will be thick. Top with half of the raspberry sauce and swirl in with a knife. Bake in the preheated oven for 25-27 minutes until set in the center. After removing from oven, immediately sprinkle chopped chocolate over the top. Once it melts, you can gently swirl with a toothpick (optional). Allow to cool to room temp before cutting into squares. Chilling in the fridge or freezer will bring out a fudge texture and make them easier to cut as well. Enjoy! 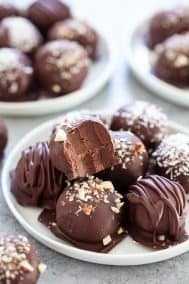 *Great option for paleo friendly dark chocolate here. Can I use chia eggs instead of flax? These look so rich and decadent! I love the chocolate and tart raspberry flavors together. Definitely making these for V day! Hear look awesome! Do you think this will work with cassava instead of almond flour? If so wouldnthe amount be the same? These look absolutely AMAZING! I’m all about that fudgy brownie life! Made these tonight for valentine’s tomorrow. They are absolutely delicious! I don’t want to share. I will definitely sneak a few for myself to keep before gifting the rest. Thank you for this delicious recipe. So yummy! I made them for my husband and I and some friends (I’m the only gluten, dairy, and grain free one in the group). Everyone loved them! They are so delicious (especially heated up slightly). I will definitely make them again. 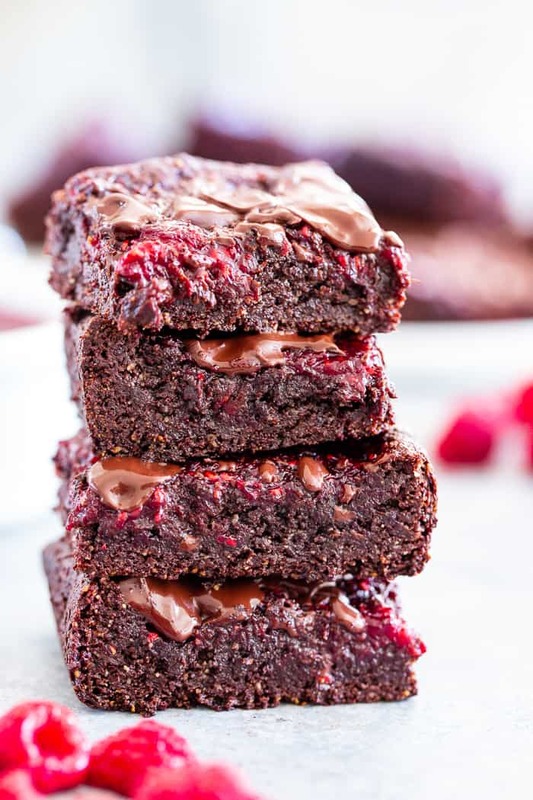 This was my first try at Fudgy Raspberry Brownies from scratch and they were SO good! Thanks controlpanel for allowing mat at this post.